Definition at line 32 of file CQReactionDM.h. Definition at line 24 of file CQReactionDM.cpp. Definition at line 33 of file CQReactionDM.cpp. Definition at line 49 of file CQReactionDM.cpp. References COL_EQUATION, COL_FLUX, COL_NAME_REACTIONS, COL_PARTICLE_FLUX, COL_RATE_LAW, COL_ROW_NUMBER, flags(), FROM_UTF8, CChemEqInterface::getChemEqString(), CCopasiRootContainer::getDatamodelList(), CReaction::getFlux(), CReaction::getFunction(), CCopasiObject::getObjectName(), CReaction::getParticleFlux(), CQBaseDataModel::isDefaultRow(), mNewEquation, and rowCount(). Referenced by setData(), and setEquation(). Definition at line 38 of file CQReactionDM.cpp. Definition at line 118 of file CQReactionDM.cpp. References COL_EQUATION, COL_FLUX, COL_NAME_REACTIONS, COL_PARTICLE_FLUX, COL_RATE_LAW, COL_ROW_NUMBER, FROM_UTF8, CCopasiRootContainer::getDatamodelList(), CModel::getFrequencyUnitsDisplayString(), and CModel::getQuantityRateUnitsDisplayString(). Definition at line 327 of file CQReactionDM.cpp. References ListViews::ADD, COL_NAME_REACTIONS, CQBaseDataModel::createNewName(), CCopasiRootContainer::getDatamodelList(), CReaction::getKey(), CQBaseDataModel::notifyGUI(), ListViews::REACTION, and TO_UTF8. Definition at line 376 of file CQReactionDM.cpp. References C_INVALID_INDEX, CQMessageBox::confirmDelete(), FROM_UTF8, CCopasiRootContainer::getDatamodelList(), CReaction::getDeletedObjects(), CCopasiDataModel::getModel(), CCopasiObject::getObjectName(), CModel::getReactions(), CQBaseDataModel::isDefaultRow(), and CQBaseDataModel::removeRow(). Definition at line 342 of file CQReactionDM.cpp. 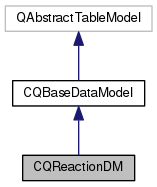 References CCopasiVector< T >::begin(), ListViews::DELETE, CCopasiRootContainer::getDatamodelList(), CModel::getReactions(), CQBaseDataModel::notifyGUI(), ListViews::REACTION, and CModel::removeReaction(). Definition at line 29 of file CQReactionDM.cpp. Referenced by data(), and CQReactionsWidget::deleteSelectedReactions(). Definition at line 182 of file CQReactionDM.cpp. References ListViews::CHANGE, COL_EQUATION, COL_NAME_REACTIONS, CQBaseDataModel::createNewName(), data(), CCopasiRootContainer::getDatamodelList(), CReaction::getKey(), CQBaseDataModel::insertRow(), CQBaseDataModel::isDefaultRow(), CQBaseDataModel::notifyGUI(), ListViews::REACTION, setEquation(), CCopasiObject::setObjectName(), and TO_UTF8. Definition at line 218 of file CQReactionDM.cpp. References ListViews::ADD, ListViews::CHANGE, COL_NAME_REACTIONS, CQMessageBox::confirmDelete(), CReactionInterface::createMetabolites(), CReactionInterface::createOtherObjects(), data(), ListViews::DELETE, FROM_UTF8, CKeyFactory::get(), CReactionInterface::getChemEqString(), CCopasiRootContainer::getDatamodelList(), CReactionInterface::getDeletedParameters(), CReaction::getKey(), CCopasiRootContainer::getKeyFactory(), CCopasiDataModel::getModel(), CReactionInterface::initFromReaction(), CChemEqInterface::isValidEq(), ListViews::METABOLITE, mNewEquation, ListViews::MODEL, CQBaseDataModel::notifyGUI(), ListViews::REACTION, CModel::removeLocalReactionParameter(), CReactionInterface::setChemEqString(), CReactionInterface::setFunctionWithEmptyMapping(), TO_UTF8, and CReactionInterface::writeBackToReaction(). Definition at line 55 of file CQReactionDM.h. Referenced by data(), and setEquation().